With its curved and domed design, the NOMOS Orion almost resembles a UFO. This watch is simpler and tidier than any other timepiece from this Glashütte-based manufacturer. The top model features a Neomatik caliber with a date display. The Orion is one of the most highly coveted NOMOS watches. Its simple design and excellent technology have already won it numerous awards and other accolades. A round case, domed sapphire glass, and long, narrow lugs make the Orion look like a UFO from the Star Trek universe. The collection's top model is the Orion Neomatik 41 Date. 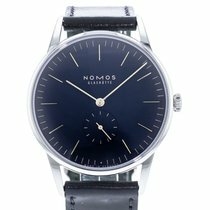 NOMOS first presented this 40.5-mm timepiece in 2018. The in-house caliber DUW 6101 powers this watch. Despite its central oscillating weight and date disc, the DUW 6101 is only 3.6 mm thick. The NOMOS Swing System is this movement's beating heart. The Swing System is the company's own escapement, which is comprised of a balance, balance spring, lever, and escape wheel. Very few manufacturers are able to produce their own escapement system. This makes NOMOS much more independent than other brands. 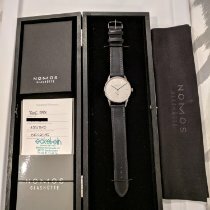 How much does a NOMOS Orion cost? The manual watches in the Orion collection mark an affordable entry point into the world of NOMOS. You can purchase the 33-mm edition with a steel case back and the reference number 321 for about 1,400 USD new and 1,300 USD pre-owned. The model with a sapphire glass case back offers a view of the Alpha movement and demands between 1,300 and 1,600 USD. The Orion 33 Rose and Orion 33 Champagne are especially feminine. The Rose has a rose-colored dial and gold-plated hands and indices. Its prices sit around 1,600 USD new and 1,400 USD pre-owned. The version with a champagne dial and rhodium-plated hands and indices costs about the same. The NOMOS Orion 1989 features gold-plated hands and indices on a November gray dial. This model is highly coveted and sells for about 1,700 USD in mint condition. How much do 35-mm unisex watches cost? The 35-mm editions are great for both men and women. Thanks to their large, bright dials, thin bezels, and elongated lugs, Orion watches always feel a bit larger than they really are. You can buy the standard model with a steel case back and the reference number 301 for about 1,600 USD in mint condition. Prices for pre-owned watches often sit below 1,200 USD. If you'd prefer to see the manual Alpha movement at work, you should take a look at the versions with a domed sapphire glass case back. These cost between 1,300 USD pre-owned and 1,800 USD new. The 35-mm Orion with a white dial is available with rhodium-plated hands and indices or tempered blue hands and gold indices. 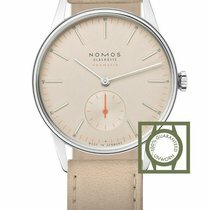 The NOMOS Orion 35 Rose is aimed mainly at women. Similar to the 33-mm model, this timepiece features a rose-colored dial and gold-plated hands and indices. In terms of price, you can expect to pay about 1,700 for a new watch and 1,400 USD for a pre-owned one. The Orion 35 Anthracite has a much more masculine feel. Its rhodium-plated hands and silver indices stand out beautifully against the dark gray dial. Prices for this watch are comparable to those for the Orion 35 Rose. If you find the 35-mm Orion too small or prefer watches with a date display, you will enjoy the 38-mm Orion models. With a white silver-plated dial and no date display, this timepiece sells for around 1,700 USD new and 1,500 USD pre-owned. The version with a date display is a bit more expensive and changes hands for anywhere between 1,700 and 2,100 USD. The Orion 38 comes with a gray or November gray dial. The latter version is known as the Orion 38 1989 and, like the 33-mm edition, pays homage to the fall of the Berlin Wall. An anthracite-colored suede strap perfectly complements the dark dial and gold-plated hands. Mint-condition examples of this timepiece sell for a good 1,800 USD, while pre-owned examples cost about 1,600 USD. The dial of the gray model is much lighter than that of the Orion 1989 and features rhodium-plated hands and white indices. This model is slightly more affordable than the 1989 edition. 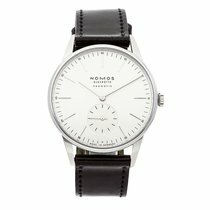 The NOMOS Orion is also available with an ultra-flat automatic caliber. These models have the word "Neomatik" in their names. The highlight of the entire collection is the NOMOS Orion Neomatik 41 Date, which comes with a white, olive gold, or midnight blue dial. It is the largest Orion model and demands prices of around 3,100 USD. Since this model is so new, pre-owned models are currently hard to come by. Orion Neomatik watches without a date display are more affordable. The elegantly modern Orion Neomatik 39 Silvercut has a horizontally satin-brushed dial and costs about 2,900 USD. Pre-owned examples are still quite rare and only cost about 230 USD less. This price range also includes the Orion Neomatik 39 Midnight Blue with a dark blue dial. Models with white silver-plated dials are only slightly less expensive. The NOMOS Orion Neomatik is also available as a 36-mm watch. The version with a white dial sells for around 2,700 USD new and 2,300 USD pre-owned. The Orion Neomatik Champagne has a more feminine touch. You can purchase this timepiece for about 2,900 USD in mint condition. Pre-owned watches are still uncommon and, therefore, only marginally more affordable. NOMOS outfits each dial with the bare essentials for telling the time: thin hands, a small seconds dial at 6 o'clock, and very fine indices. The hour markers have been shifted inward, which helps them stand out from the delicate minute scale. For the dial color, you can choose from white, midnight blue, silvercut, champagne, rose, anthracite, or gray. The range of case sizes is equally expansive, meaning this collection is sure to have something for everyone. The Orion's design has received numerous awards in recent years. For example, in 2014, the gray version of the Orion 38 came in second place for the Goldene Uhruh , one of the most famous annual German watch awards. Instead of an expert jury, the readers of the watch magazine "Uhren-Magazin" voted on the winner. The Design Zentrum Nordrhein Westfallen in Essen, Germany has been awarding the internationally renowned Red Dot Design Award since 1954. The white Orion 38 won this distinction in the Product Design discipline in 2011 and has been a fan favorite ever since.